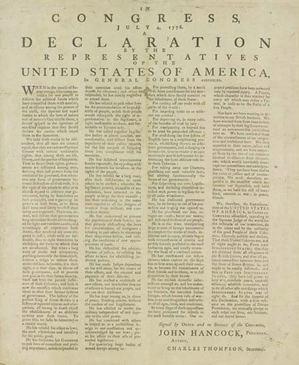 Beginning in April 2010, Sotheby’s New York will have the privilege of offering the James S. Copley Library, an astonishing survey in original manuscripts of American history and worldwide literary, artistic and scientific achievement. The core of the collection is its remarkable range of handwritten letters, documents, and other manuscripts which trace this history of America from the earliest incursions of Jesuit missionaries into California through the archive of letters sent by General Eisenhower to his wife from the battlefields of Europe. The depth and breadth of the library is astounding, reflecting the interest and passions of an inspired collector and newspaper publisher along with a dedicated curator who together sought the finest works available. Assembled primarily during the 1960s and 70s, a ‘Golden Age’ for manuscript collecting, the Library numbers approximately 2,000 manuscripts, books, pamphlets, broadsides and maps and is valued at more than $15 million. Consigned by The Copley Press, Inc., the Library will be sold in a series of eight auctions that will be held over the course of a year, beginning in April. James S. Copley was born in 1917 and adopted by Col. and Mrs. Ira C. Copley after his parents succumbed to the flu during the epidemic of 1918. Col. Copley bought The San Diego Union and Evening Tribune in 1928 and, following his death in 1947, Jim became the CEO of the corporation publishing a large group of newspapers, including the San Diego Union-Tribune. He remained editor of that paper and CEO of Copley Press until his death in 1973. He was the recipient of numerous industry awards and he and his wife, Helen K. Copley, were notable philanthropists to the San Diego area; endowing the Copley Auditorium at the San Diego Museum of Art, the Copley Library at the University of San Diego, Copley Symphony Hall, the Copley Center at the Scripps Clinic and Research Foundation and a YMCA facility, among others. Always a voracious reader, Mr. Copley’s manuscript collecting made him realize he could also obtain first editions as well as original letters of his favorite authors - principal among them is his fellow California newspaper man, Mark Twain. The Mark Twain Collection is rich in letters, both to Twain’s publishers and family and friends. A number of manuscripts relate to some of his more famous publications and the collection also includes an unpublished autobiographical manuscript entitled A Family Sketch. Other literary and artistic luminaries featured in the collection include Emily Dickinson, F. Scott Fitzgerald, Charles Dickens, Sir Arthur Conan Doyle, T. S. Eliot, Charlotte Brontë, Willa Cather, James Joyce, George Gershwin, Julia Ward Howe, and Peter Ilich Tchaikovsky, among many others. Achievements in science and the minds behind them also fascinated Mr. Copley, and among the offerings from the Library is a significant group of letters and two speeches by Albert Einstein. Other noteworthy names acquired by Mr. Copley include Sir Isaac Newton, Marie Curie, Louis Pasteur, Charles Darwin, Thomas Edison and Alexander Graham Bell.